ArtHelix is proud to present, for a second time, the paintings of Mari Rantanen. Rantanen is a Finnish artist who has been living and working in Stockholm for almost 20 years and currently spends alternating three­month periods in New York City. 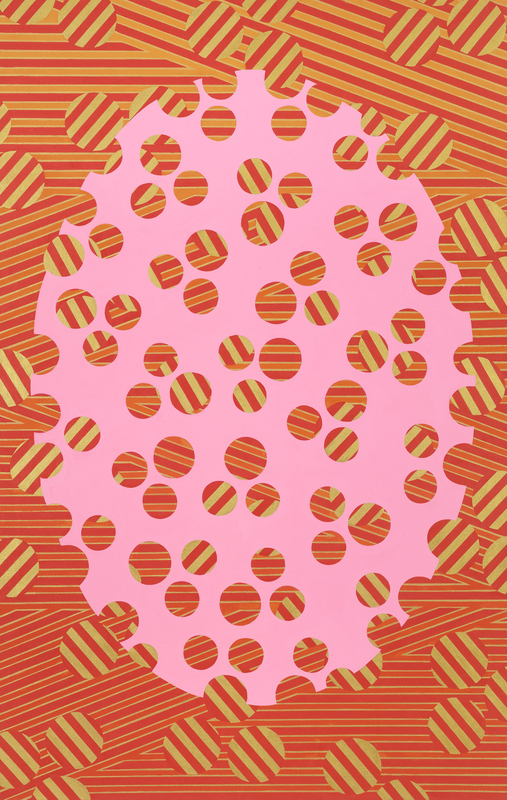 Since her last exhibition at ArtHelix in October 2014, she has transitioned her paintings from sites that explored visual, historical, and cultural motifs, works that referenced those contextual patterns, colors, and designs, to a more complex emotional place that is at once exuberant and conflicted. Rantanen is now combining a more personal dissonance to her opus. Mari Rantanen’s new paintings move away from her oval shaped canvases, a shape that hearkens back to traditional portraiture. Now the oval motif is imbedded inside a rectangular frame. She sees the shapes as a forces of two worlds, occupied in one place to mingle. The novelist Jhumpa Lahiri, from a lecture that Rantanen attended, inspired these new paintings. Lahiri discussed her Indian heritage, having been born in India and raised in the U.S., she spoke of how her parents would systematically save their money to take the entire family back home to India every year. Traveling from one culture to another, Lahiri noted that when she was in the U.S., she felt the absence of her Indian culture, effected by her parents but conversely, when she was in India, there was a sense of absence from her more westernized daily life in the U.S. Her parents’ longing for India was constantly palpable; creating a home life that was filled with feelings of isolation and longing. This lecture had a profound impact on Rantanen, recognizing for herself this cultural dilemma; a sad sense of something that is always lacking wherever she is working and living. The oval shapes within rectangular frames are tropes for Rantanen, seeing the motifs as a complex sense of absence and distance, where one shape lacks what the other contains. The oval in the rectangle is the absence, one world within the rectangle as the container, which is off in the distance, always in the background. However unlike Jhumpa Lahiri, whose description of absence and distance is melancholy and discontented, Rantanen is exhilarated by what would seem to be a state of dearth and remoteness. The exuberant colors she uses are combative and optically cheerful and pleasurable. Her distance and absence composition holds an extremely vibrant palate, creating a dissonant and frantic visual excitement. Everything seems to be happening at the same time in Rantanen’s paintings. The light the paintings generate and reflect presses on our frontal lobe, almost blinding anyone who looks upon them but not sad for those who do not recognize her narrative. Mari Rantanen’s work is in the private and public collections of most all Nordic countries. She is also represented in numerous collections in Germany, England, Holland, as well as the United States. In 2015 she will be included in an exhibition Dark Days, Light Nights at the Kemper Art Museum in Kansas City, Missouri, October 1, 2015 to February 20, 2016.